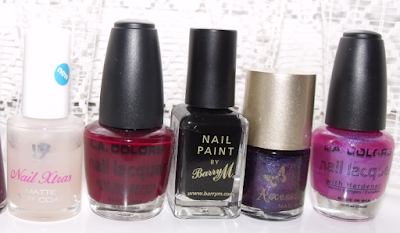 Since I already took a photograph of my whole nail varnish collection to show you how ridiculous big it is, I thought I'd take pictures of my favourite polishes (sadly no nail swatches - I still haven't got the hang of taking decent photos of my nails) and write about them. 1. L.A. Colors Color Craze in Tropical Breeze - if I made a April Favourites list this would definitely be the star! When I first applied it I was disappointed as the first coat is really sheer but after the third it's a really lovely lilacy purple. It also makes a great base for glitters. 2. Maybelline Colorama in Jelly Bean - this is such a brilliant turquoise. A tad streaky on the first coat but fine after the second. They don't make these any more but there are loads on eBay. 3. Bourjois So Laque in Bleu Violet - a beautiful blue that I don't wear a lot because I only have a few outfits that will go with it, but that applies and dries really well. 4. Revlon Facets of Fuschia - one that I shouldn't even need to name if you're a make-up blogger! The cosmetics blogosphere was obsessed with this one around last Christmas, people were getting friends to send them bottles because they couldn't find it locally etc. It is fab and I think it was limited edition (I haven't seen it since) so I'm making it go further by applying plain black polish (a super cheap one from Miss Sporty) first. 5. 17 Nail Xtras Matte Top Coat - a fantastic, cheap, fast-working, matte top coat. I love the way this can transform a polish, though I have to remember that they usually end up looking darker once they've been mattified. 6. L.A Colors Nail Lacquer in Plum Wine - an amazing deep red. 7. Barry M Instant Nail Effects black crackle - the easiest nail art method ever! Also my secret weapon for avoiding nail varnish remover - if my polish is chipped I just fill the gaps of naked nail in and slop this on top and no one can tell I did a repair job. 8. 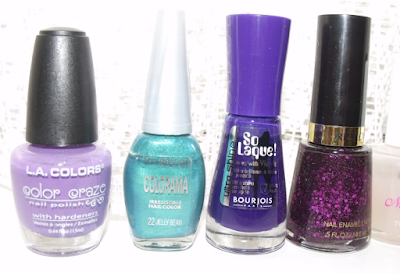 Accessorize Purple Dream - the most beautiful polish my nails have ever worn. It looks like a purple base with pink sparkles it it. Or are they blue? It depends on which way the light is hitting it, which means that when I'm wearing this I spend a lot of time tilting my hands in the light. 9. L.A. Colors Nail Lacquer in Shocker - a bright pink with a blue duochrome effect, I think this is lovely. I've become a big fan of L.A. Colors polishes. They're only 99p in Beauty Base, despite the generously sized bottles. The brushes are a bit stubby but the polishes are quite thin in consistency so they're easy to apply, The thinness also means that they wear down at the tips rather than chip off, which is great as it means that I can just pop a fnew coat on top of the old one and the finish will be just as smooth as it would have been if I'd taken the polish off and applied a fresh coat. £7! I got for Christmas when there was a 3 for 2 on Revlon, luckily! Thanks!